Every once and a while you get a book so perfect, it hits every high note. Literally. When I read Starswept last year, I was blown away: the story was compelling, the plot was unpredictable, and there were such amazing twists that I was continuously caught by surprise. So when the author said there were ARCs available, I pounced; and let me tell you, it’s going to be so hard to wait until February for when I finally talk freely about it! Spoilers for Starswept from here on out. Treat yourself to a copy then come back here! Wayward Stars picks up a month after Iris went into hiding with the rebels, a wise move from the author as she puts us right back into the action. From the very first chapter, the book catches you off guard, setting up to be one kind of story and instead spiraling into another. The author has such a skillful way of building you up to an event you might think is predictable, then swerving away at the last minute, just like in the first book (you know the twist, I mean!). 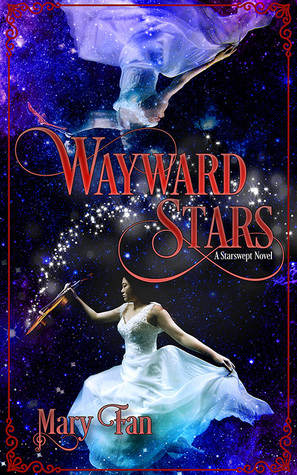 Unlike the first book, focusing on Iris’s discovery of the Karys’il manipulation, Wayward Stars focuses on the fight against it. The rise of the abolition movement is something we all want, but it comes at a steep price, not to mention is incredibly dangerous. Iris and her growing team of artists and Adryil must live in the shadows, facing the dangers of leading a revolution. Both Iris and Dámiul go through extreme growth in this book. While I want them to be happy and cute and to get to go on normal dates, we know that’s not the focus of this story. They’re put through so much, and they change as a result, leading to exceptional growth. I can’t wait to see how they’ll be at the end of this. As for the rest, I don’t want to give it away. Suffice to say the author brings the same magic back to the page as she did in the first book. The love of music and the fight for freedom coming together in beautiful ways. I highly recommend this series for anyone who has a passion for the arts and a head in the stars. It’s beautiful, poignant, and one heck of a thrill ride.